Albuquerque’s politicians are “feeling their oats” these days. With Mayor Tim Keller having been in office for a year at this point and confronting the disastrous ART and even attempting to hold back the tide of subsidies for TopGolf (all while raising taxes), it appears that 2019 will be a much more ambitious year of policymaking in New Mexico’s largest city. We have a plastic bag and straw ban already moving and mandatory paid sick leave refuses to die. Oh, and the City faces a $20 million budget deficit despite that aforementioned tax hike. But how is the City faring on the basics of governance and its finances? Not particularly well according to a new “Financial State of the Cities” report from the Center for Truth in Accounting. As the following shows, the City received a “D” grade overall and faces rising pension and employee health care liabilities in part because the City has not funded them appropriately. 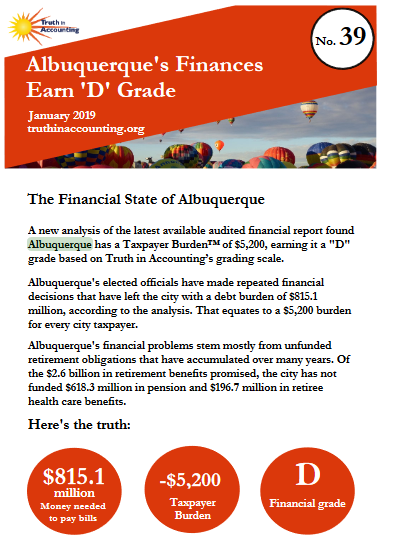 Before Albuquerque’s political leaders impose new costs on local residents and businesses, perhaps it would be wise to tackle the very real financial challenges facing the City? Of course Rio Grande Foundation has laid out detailed paths forward for the economy and for the City’s troubled and bloated budget.